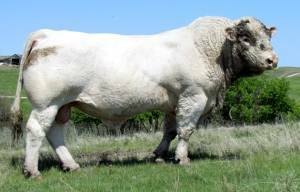 Roundup is one the world's most popular Charolais sires. His Canadian EPDs rank him in the top 10% of the breed for low BW with 88% accuracy, and have him in the top 3% for YW EPD! He had a 120 growth ratio in a large contemporary group and weighed 1511 at yearling. He's also top 1% maternal, top 1% for marbling, plus he's homozygous polled!